Last week, German-based SMA Solar Technology announced it would open a manufacturing facility in Colorado, spend approximately $22 million on it's first non-European site, and hire 300 to 700 Denver workers starting in 2010. It should be noted that Colorado is listed among the top five states to do business according to Forbes magazine and CNBC. It was rumored that many states were in the running for SMA -- a company that makes components that integrate residential solar panels with electrical grids. For a state with a "Million solar roofs" policy, I'd like to know what California did to court this company. Why didn't they receive the same treatment as Tesla motors with a sales tax exemption on capital equipment or something similar to attract their impressive operation? Colorado has now landed at least 300 high paying manufacturing jobs that will contribute to its growth and emergence from the national recession, while California continues to pass environmental policies on the notion -- not economic analysis or proof -- that the environmental frontier exclusively creates jobs and helps the economy. 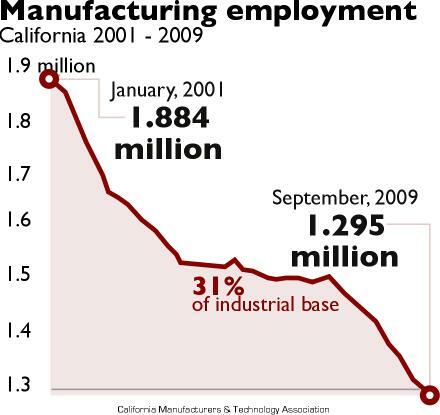 The state legislature regularly implies that businesses aren't moving out of California but they say nothing about the 589,0000 lost manufacturing jobs from the state - the largest percentage decline of any state in the U.S. This SMA announcement, and so many others, indicates that our problem is getting worse. We aren't taking advantage of the limited opportunities that exist to bring high-wage job creators to the state, never mind the ones we're leaking. The Milken institute put out its 2009 California business costs last month and indicated our taxes, wage burden and electricity costs are 15, 13 and 33 percent higher than the national average respectively. This doesn't even take into account the regulatory uncertainty and costs foisted upon our manufacturers. In the same week, Time magazine wrote a cover-article titled "Why California is still America's future." A piece which I'm sure will be twittered, e-mailed, used as more proof of California's perpetually automatic success, and most certainly go uncontested. The word "manufacturing" is not used once in the 3,200-word piece, which highlights a few impressive innovators in the state and boasts about California being the "cutting edge of American future -- economically, environmentally, culturally and maybe politically." Huh? California's pioneers and innovators are integral to our success but "innovation" has become the ultimate buzzword for enlightened prosperity. Never mind the thousands of people who put stuff together, work hard and make a family budget. These workers are subconsciously devalued by our lack of interest in their jobs, wages and employers. Time magazine's print version had the following pull-quote from a genomic pioneer about his reasons for operating in California, "This is the most dynamic place for change on earth. That's why we're here. It is pretty nice not to have to wear pants." Manufacturing employees from Opti-Solar (the recent California solar manufacturing facility that shuttered most of its operations) don't care about the length of their pants or that California is dynamic. They want a job to pay their mortgage! Get out and talk to manufacturers in California and abroad. We're losing!!! Our manufacturing employment is at a decades-long low. Manufacturers are revenue machines for state government, and California will likely face at least another $10 to $15 billion deficit next year. There are so many issues for policymakers to start with: high electricity rates, regulations with no regard for economic impact, growing unpredictability. All issues that could be fixed with little to no money. I've said it before and I'm going to say it again: Manufacturers are good actors bringing in high salaries, incredible benefits and producing the technologies, products and innovation that drive a regional superpower and its economy. These are employers who should be courted at every turn, not left to ponder their future based on their close vicinity to the Pacific Ocean, a few Universities and workplace wardrobe. I went to the article, "Why California is still America's future." by TIME and after getting half way thru I noticed how it credits California for creating the integrated circuit when EVERY techie and nerd should know it is Texas Instruments. I actually now may read the articles but now will be more critical on the information i read from this source; I think its biased.